Today was sunnier and warmer than it's been in a while. Here are shots of my ribes, columbine front and back enjoying the sun. So I feel like my blog has been a little light on the California and CA native focus lately. 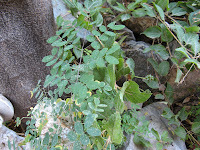 And since we've had a ton of rain, hiking seems unlikely at the moment, so that leaves my garden. 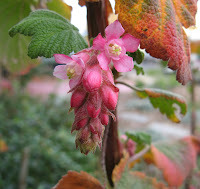 Here are more pics of the Ribes malvaceum pictured in my last bloom day post. It has indeed started putting on its show. I think in another week or two it will be even nicer. 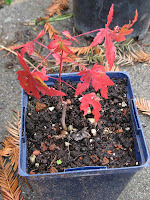 I planted 5 western columbine (Aquilegia formosa) under the camelia in the front yard. I had a bunch of seedlings from the two in back and thought they could compete with the roots and survive the dry shade. I lost one of the 5 and thought I would lose many more to cats using them as litter boxes and a helpful neighbor giving us free mulch on top of them, but now with the rains they are full and happy and this one is getting ready to flower. The yerba buena (Satureja douglasii) I potted up and moved to the front steps really likes both its new location and all the rains. It has filled out wonderfully and some fresh yerba buena mixed with a dried leaf of white sage (Salvia apiana) is now one of my favorite winter teas (though I guess I should technically call it an infusion). It's very flavorful, so probably not for everybody. And here was a surprise. 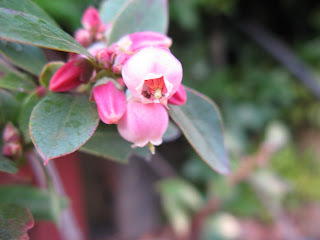 My manzanita (Arctostaphylos pajaroensis 'paradise') is blooming. I wasn't expecting this. It's a small manzanita I just planted in May. But today I saw a touch of pink out of the corner of my eye. Aside from the constant rain, I don't think I had noticed them because almost all of the blooms are along the bottom edge, very close to the ground. I'm very happy all the same. 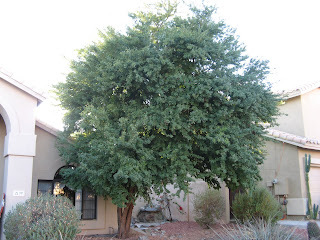 The Texas ebony (Pithecellobium flexicaule) is a tree with low water needs. But careful it does have spines. 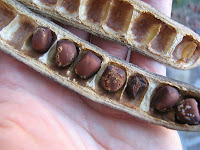 And some cool seed pods. 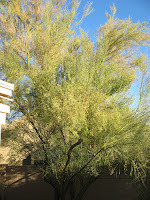 Here's the Palo Verde in back. Literally green stick in Spanish. In the second pic you can see the green trunk and branches. The third pic I included just because I liked it. It's looking up into the canopy. To me it looked like I was in some palo verde forest or something. 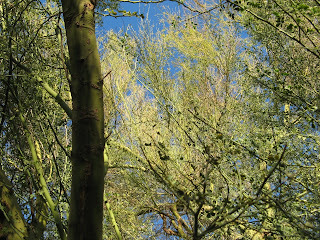 Evidently there are two species native to Arizona, the Blue Palo Verde and the Foothill Palo Verde, being blue-green and yellow-green respectively. Anyone want to vote? Again, what a difference some water makes. 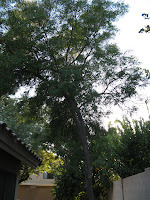 The tree-like plant is a Mexican bird of paradise and based on this blog post by Bill at designinginthedesert, I think its Caesalpinia mexicana, but who knows. It originally looked a lot like the sproutling in the second picture when I was about 17 or 18. It was a little volunteer that I used to water when I went out in the backyard and that tree is what resulted. It wasn't on any irrigation, but has obviously tapped into something. So before I completely leave Arizona for a while, I wanted to share some pics from my parents' yard in Phoenix. Though there are the obligatory cacti, there are also some really interesting trees (featured in my next post) that might surprise those from wetter climes. 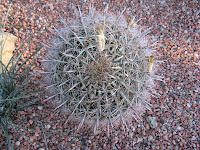 First off, here are some pics of the barrel cactus in the front yard. The first shot is from above, the second is of a dessicated flower? You can also see the nasty spines. 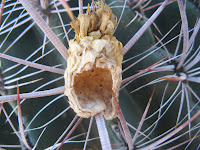 This is the cactus you can slice open and drink the pulp in the center if you're dying of thirst. But it's much easier and less harmful to just bring water. 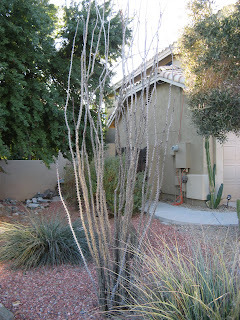 Here's a shot of the ocotillo, bare still from lack of water. 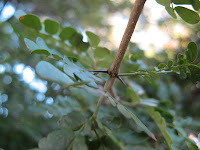 When the rains come this guy becomes covered in dark green leaves with bright red flowers on the top of each stalk. 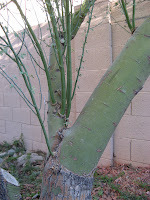 I immediately liked this plant when we moved to Arizona. You could see them from the freeway driving in from L.A. and for me epitomizes the desert much like saguaros. Always plant in odd numbers my friend Anita always tells me. Even numbers are too easily divided in half by the eye. So unless it's a specimen plant, 3 is the minimum number. 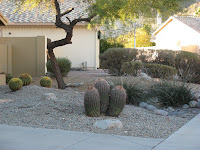 These cacti are in the neighbor's yard. 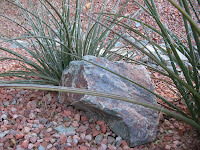 And, of course, besides cacti, nothing says desert landscaping like rocks and gravel. So it's that time again. 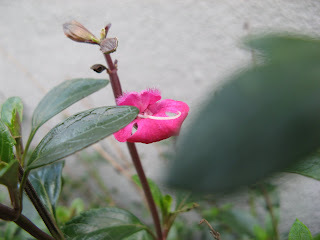 Carol over at May Dreams Garden is hosting Garden Bloggers' Bloom Day. At first, I thought my blooms were a little disappointing. I was really hoping my natives, like manzanita and ceanothus, would be blooming and it feels like more was blooming in December than now. But as I took pictures, I realized that some of the other natives picked up the slack and that January is the month of little surprises. The star of the show is definitely the Ribes malvaceum. I prefer Ribes sanguineum, which has more delicate architecture, larger and softer leaves, and longer bunches of flowers, but I grew this guy from a cutting and he's getting ready to put on a spectacular show in another week I think. It's already looking mighty fine. 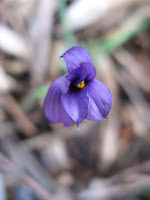 The blue-eyed grass (Sisyrinchium bellum) is just putting out its first flowers. I got out there a little late so it was already starting to close for the night. 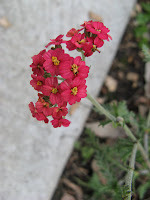 And a transplanted yarrow put out a little stalk of flowers. 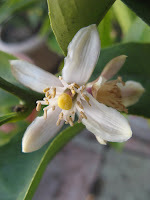 As for non-natives, we first have lots of fruit flowering. Lemons. 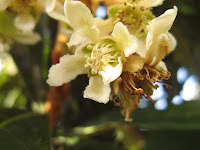 And loquats, not the prettiest flower, but they lead to really delicious fruit. Technically from the neighbor's tree, but this branch is in my yard. 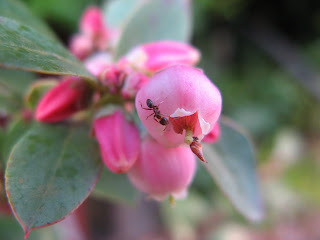 And this Sunshine blueberry, with an ant on the outside...and then on the inside. I didn't even realize it was there, till I checked to see how the photo had turned out. 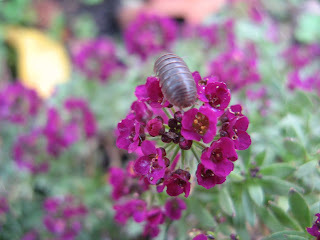 Another little visitor was this roly poly on the alyssum. They seem to have many names depending where you are from. Their most common name is pillbug. Not sure what the roly poly was doing, but it kept rearing up its head. Not a fruit, but a flower. 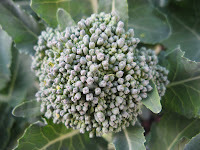 Broccoli, of the Decicco variety. Supposedly brought to the San Francisco area by Italian immigrants, it has done exceedingly well in my garden. And its open growth pattern doesn't encourage aphids. 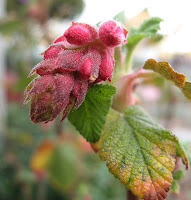 And this salvia that looks like some alien carnivorous plant. So while eating breakfast the other day, I found our resident squirrel scurrying in our backyard. In the fall and early winter he tends to dig up all my potted plants in an effort to hide acorns, or sometimes I think just to annoy me. This year actually it wasn't that bad. It might be because last year I sprinkled copious amounts of chile powder and put little squirrel size stakes (read toothpicks) in the pots that got the most attention. It didn't stop the little guy but it definitely slowed him down. But this prompted a search via teh interweb and I found that my resident squirrel is an introduced species from back East, the Eastern Fox Squirrel (Sciura niger) and that they on occasion eat insects, birds' eggs, small birds and lizards. I had no idea. 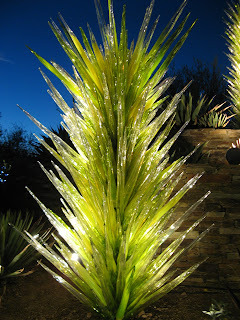 At the entrance to the Desert Botanical Garden were three sculptures by Dale Chihuly. 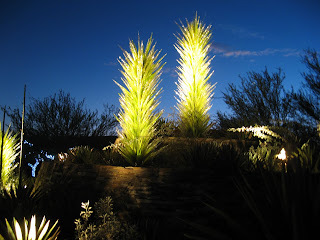 He had a big temporary installation of his work in the Desert Botanical Garden in Phoenix from Nov '08 to May '09. (If you follow the link, click on the tiny red triangle at the bottom to see more pics.) My parents went and really enjoyed it. The following are pics of "Desert Towers - 2008" at the entrance. It's hard to see, but the light is coming from inside the sculptures. A last pic, of all three, after I learned how to use the tripod. 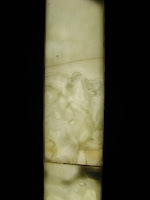 Not related to the glass sculpture, but also near the entrance were cement benches inlaid with some stones that were lit from underneath/inside, creating a glowing stone bench. 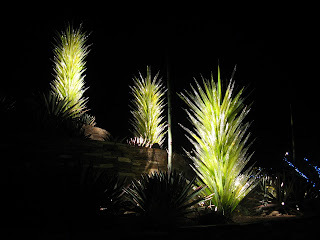 I have to say I much prefer this type of night-time illumination in the garden to training a spotlight on certain plants, something I feel ruins the beauty of the desert at night, especially in the moonlight. But by far, my favorite form of illumination in the garden at night is stars, just stars. 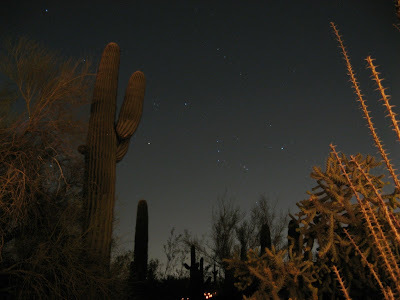 Here's a pic of Orion rising over the desert.